How to setup tenda n301 wireless router: Tenda N301 300 Mbps router is considered as a wireless router because it offers WiFi connectivity, it allows you to connect various devices to your router. The ability to access the WiFi signal on your Tenda router is dependent on multiple conditions. The router has security features used to safeguard your connection against intruders. If these routers are not configured correctly, you may not be able to gain access to your router. Step by step guide about how to setup & configure tenda n301 n300 wireless router given below. In this we provide you the information about how to setup Tenda Router? 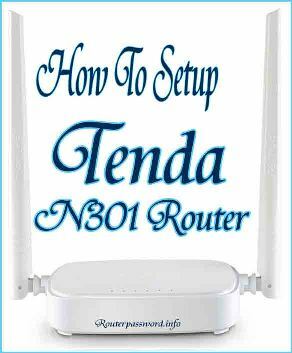 The below are the steps to follow to setup Tenda N301 Router manually. The below is the process to follow for setup the Tenda N301 Router manually. To setup the Tenda Router first of all you have to power cycling the modem and router. For that you have to do is unplug the modem and router from the power source. Connect the Ethernet cable from the modem to the WAN or Internet port of the router. And then power on your modem first, then your router by plugging them back to the power source. For that connect your computer to one of the Ethernet ports of the router. The default Tenda IP address is 192.168.0.1. Then the configuration page will open, in that under the Internet WAN, click Connection type. And then select your connection type and click next. Then enter your ISP details and click on Apply Changes button. Then click on the wireless tab to configure in the setup page. You can change the wireless network name and wireless channel. By that you can setup your Tenda N301 300Mbps Wireless Router without internet connection by your own. For more information about Tenda wireless router configuration without internet connection step by step procedure visit our website https://routerpassword.info/ and our next article about how to setup tenda n301 as wireless repeater.